The SCHEDULING REQUEST FORM is the easiest way to get started. You will be asked to provide some basic information that will help me to prepare for your shoot. No payment information is required at this point. On the form, you may indicate a date and time that would be most convenient for your shoot. I will try accommodate if possible. After receiving the completed form, I will be in touch within 24 hours. If you need to speak with me immediately, please feel free to call or text. A credit card payment is required via Square.com. Your credit card will NOT be charged until you preview and approve proof images. Images will not be released for download until payment is made. A non-refundable deposit is required for VIRTUAL STAGING projects. For real estate photography shoots in Monmouth County and Northern Ocean County (north of Toms River), please feel free to contact me for a referral. 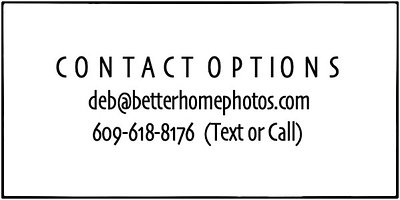 Please review my pricing and Photography Terms of Agreement prior to scheduling a shoot. Scheduling a shoot and acceptance of photos is an indication of understanding and agreement to the terms and conditions of my Photography Agreement. Use the pricing link to select a photo package that will represent the home OR allow the photographer to determine how many photos are needed to best represent the home. Once a photo package is selected and the job is complete, photos cannot be eliminated from an image package in order to lower the package price. The expectation is that the property will be photo-ready when I arrive for the shoot. Preparation resources are available on the PREP & PLANNING page. Cleaning, staging and/or moving furniture or personal items is not within the Photographer’s scope of work. A preview page with watermarked proof images will be available for preview/approval within 24-36 hours of the scheduled shoot. Real Estate clients are not charged unless the job is complete and approved. Photos are inaccessible until approved and/or paid. Non-realtor sellers must pay prior to the shoot. Proofs will be available for approval and a 50% refund will be provided if not completely satisfied.